Both the Baton Rouge Advocate and the Times-Picayune voted the movement to incorporate the City of St. George as the No. 1 news story in the capital region during 2013. But the story is growing even larger every day. • Petition Drive. 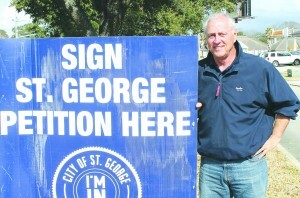 Every Saturday, the supporters of incorporating St. George have a petition drive. At present, they claim to have about 10,000 of the 18,000 signatures required to get their proposal to the election ballot. At first, they were getting 1,000 a week but it slowed down during the Christmas holiday and January’s cold weather. They now appear to be getting 500 to 700 signatures a week. Logically, the more signatures they have, the smaller the pool of people who haven’t signed. This should slow down the process. On the other hand, they may be underperforming just because of the weather, and the weekly numbers could increase dramatically with fair weather. At 500 signatures a week, they should hit 18,000 by June 1 and 20,000 by July. Organizers have said they want to get 20,000 in case some signatures are disqualified. about 10 to 1. However, the anti-St. George sign push has just begun. The sign war should heat up and continue all during 2014. Door-to-Door Canvassing. The pro-incorporation effort has walked a large portion but by no means all of the subdivisions in the proposed city. Basically, it is slow going, because people tend to be gone so much, especially on Saturday. As the campaign intensifies, door-to-door canvassing is likely to increase. Meetings, Rallies. So far, pro-St. George supporters have held several mass meetings, usually attracting 300-400 people at Woodlawn Baptist Church. On Tuesday night, the anti-St. George group drew over 250 to St. Patrick’s Catholic Church. However, according to reports by elected officials who were present, few of those in attendance were actually from the St. George area. If that is true, they may avoid holding mass meetings and rallies, in order to avoid showing weakness. money raised against St. George is likely to come from businesses who are members of the Baton Rouge Area Chamber (BRAC) or involved with the Baton Rouge Area Foundation (BRAF). While technically “neutral,” these groups form along with Together Baton Rouge, the bulk of the opposition to St. George. If the opponents do raise the money, TV airwaves, cable, and radio will be filled with anti-St. George propaganda. It is likely to be an avalanche of spending that outguns pro-St. George advertising by 10 to 1 or 20 to 1. Free Media. So far, both the supporters and opponents of incorporating St. George have gotten a lot of “free” media in the Advocate, WAFB-TV, and WBRZ-TV. The opponents of St. George have gotten the best of the argument so far, mainly by raising doubts and fears about how incorporation will work. The media is likely to continue to cover the controversy, and the challenge for St. George supporters will be how to get their message across. Telephone. The robocalls have already begun, and both sides can be expected to use the phone to try to identify their supporters and get them to the polls. As the calls increase in volume, they will probably become less effective, as voters refuse to answer their phones. Legislative Session. Once again, the Louisiana Legislature could be a battleground, depending on whether supporters decide to make another attempt at passing a constitutional amendment to create a school system or whether they decide to wait until after the incorporation vote. November 2014. The proposed incorporation of St. George will likely be on the ballot, and voters of St. George will have the ultimate say. If things go as it appears they will, 2014 will indeed be the Year of St. George!